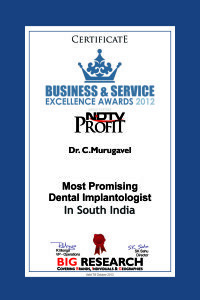 Dr. Murugavel received Business & Service Excellence Awards 2012, NDTV Profit for Most Promising Dental Implantologist In South India. 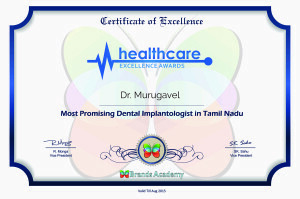 Dr. Murugavel, Health care - Excellence Awards from Brands Academy 2014 for"Most promising Dental Implantologist" in Tamil Nadu, held on August 23, 2014 at Mövenpick Hotel & Spa Bangalore. Dr.Murugavel recieved an award as "MOST PROMISING DENTAL IMPLANTOLOGIST IN SOUTH INDIA" From NDTV Profit and Big Research team. 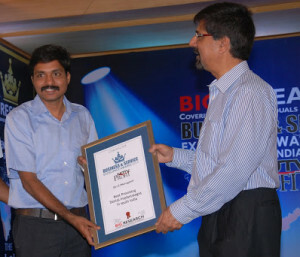 The Award was given by Mr.Krishnamachari Srikanth. 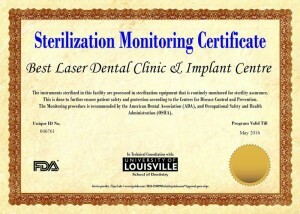 We strictly adhere to Our high standards of sterilization and hygiene . Our patients safety and health is more important to us . All instruments those used to penetrate soft tissue or bone, or enter into or contact the bloodstream or other normally sterile tissue are sterilized after each use. Sterilization is achieved by steam under pressure (autoclaving) , dry heat, or heat/chemical vapor. The instruments are first cleaned , dried , packed in special steam penetrable wrap and are subjected to high pressure saturated steam for 20 minutes.. By this method , all bacteria ,fungi , virus and spores are inactivated ( destroyed ) and the instruments become 100% sterilized . Other Instruments that don’t penetrate the soft tissue but come into contact with mucous membrane , are also sterilized by Autoclaving . Each and Every hand piece used by the doctors are autoclaved . The needles , surgical blades , patient drape( apron ) , gloves , mask , burs , suction tubes are single used and disposed immediately . The dental unit and pipelines are cleaned by disinfectant for every patient . Instruments are autoclaved and used according to the ISO standards . Sterilization monitoring is done frequently in our clinic to ensure safety and protection for our patients for a Quality Dental Treatment .